Another week, another arch. Mesa Arch in Canyonlands is almost as iconic as Delicate Arch, but it couldn’t be more different. 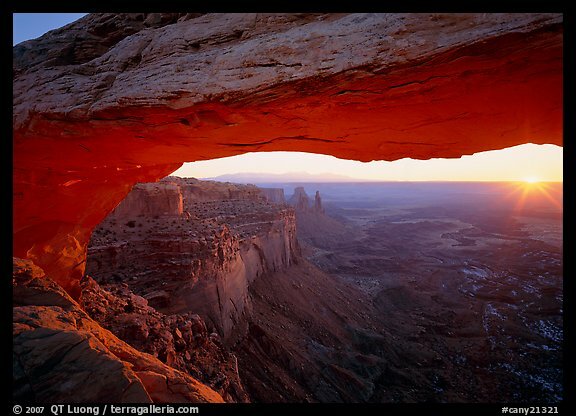 Mesa Arch is only about fifty feet wide and ten feet high, however it is remarkable for two reasons. First, because of its position, right at the edge of the mesa, next to a drop of almost a thousand feet straight down, it frames a vast expense of canyons. Second, for fifteen minutes, after sunrise, light reflects from the wall below onto the underside of the arch, making it glow with a unique intense red light that can be produced only by this particular configuration of terrain and time of the day. Reflected light almost always enhances the subject, being soft and directional at the same time. This is why reflectors of various sizes are used in sophisticated lighting set-ups. One of the defining characteristics of the Colorado Plateau is that so many of the rock formations are made of red sandstone. Sandstone reflects a lot of light, which is why a polarizing filter is so effective on those rock landscapes. Moreover, the reflected light from such sandstone is much warmer than direct light. When it reaches another patch of sandstone, it will cause it to glow with surreal warm colors. Reflected light is the key to many of the great photos on the Colorado Plateau, not only in canyons such as Antelope Canyon or the Zion Narrows where the walls act as giant reflectors, but also at a spot such as Bryce Canyon (see this picture). Naturally, you will want to come there for sunrise. The trailhead is about five miles south of the Island in the Sky visitor center, about one hour from Moab. From there, take the trail to the left and walk for about 15 minutes. Despite the cramped location, there is room for a variety of compositions. 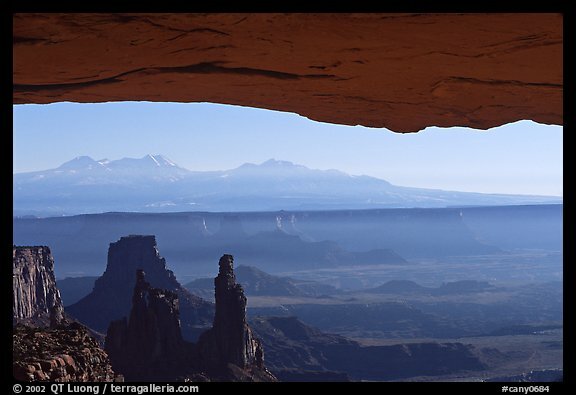 In order to see the most of the canyons and the underside of the arch from the opening, it helps to position yourself close – beware of the drop off – therefore an extremely wide angle lens can be useful. For reference, the first photograph below was taken with a 110mm lens on 5×7, which is the equivalent of a 24mm lens on 35mm (or full-frame digital). As you can see, a much wider lens would be needed to capture the span. However, a long lens could also be used to put more emphasis on the canyons, reducing the arch to an bright glowing segment on the top of the photograph. Posted on December 24, 2009, 11:18 am, by QT Luong, under National Parks Photo Spots. This can be done with a 14/15mm lens. Phillip Colla has a great series shot ultrawide there See http://www.oceanlight.com/spotlight.php?img=18037 for a perspective close to Lik’s. I think any time of the year should produce the glow under the arch. My photograph was taken in November. If you come during summer, the sun with be further on the left, which may be more difficult to include in the composition, and would leave the cliff less lit.